Warehouse Management Software is an essential asset to manufacturing sites — Accuracy, Traceability and Mobility are the components continually in demand when operating such a site considering the amount of inventory being moved around and the deadlines to be met. 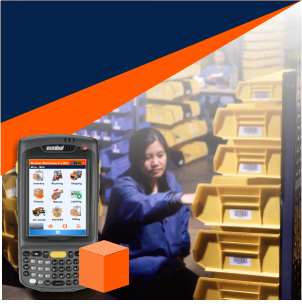 Whether it’s minimizing on physical inventory time, staging materials faster or tracking of raw materials through to finished products; our WMS, Wireless Warehouse In A Box™ is your complete solution to successful management for your manufacturing inventory. Using multiple methods of identification (I.e. barcodes, labels, etc) we are able to analyze, manage, and trace all inventory content information, movements within the warehouse and transactions while mobile. Using your mobile devices / scanner with our software provides you with complete control over your warehouse — not just the collection of data. Every time a identifier is scanned it is updated in the system in real-time giving you live access to your inventory information. Applying this technology has the power to drastically improve the manufacturing management process and lower the operating costs of inventory storage and manual data collection. Software with this capability ensures lesser time spent on production and inventory changes as well as extensive improvements to inventory accuracy and visibility. Common issues with manufacturing are that inventory often gets misplaced or mismanaged leading to inaccuracy and errors throughout their life-cycle in the warehouse and throughout the logistics process. Putting a Warehouse Management System in place will remove these headaches in it’s entirety. Learn how our solutions can directly improve your warehouse enhancing your productivity and carving your path towards success in logistics. Please make your selection based on the types that best meet your business! CUSTOMER VALUENo matter what type of service you provide — Contract, Public, Cold Storage, etc., Our Warehouse Management Software has been designed for adaptability and tailoring based on each individual business requirement.